A few years back, Mornington Peninsula Brewery was one of the first local breweries to release a beer commercially showcasing the much-hyped new US hop Mosaic. If memory serves, The Crafty Pint's first encounter led us to believe it was the most juicily orangey of IPAs we'd come across at that point. 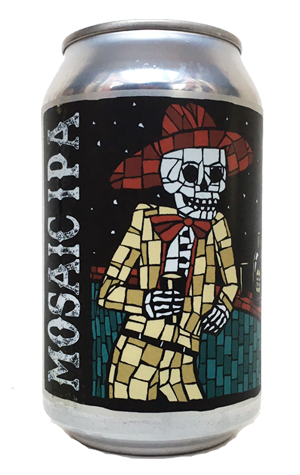 But, as the hop has become one of the most popular for local brewers (particularly in American influenced pales and IPAs) it's become clear why it was given the name "Mosaic" as, used in different ways and in different brews, it can give a brewer many different characters to play with. Certainly, now that Mornington's Mosaic IPA has become its seventh limited release can – and its best looking in terms of how the label sits on the can – there's more than the mandarin that leapt from the glass at The Alehouse Project on its first release. There's heaps of peach and, particularly to taste, flavours that bring to mind Wrigley's Juicy Fruits chewing gum. They sit alongside soft, creamy caramel malts in what's a rather smooth affair.